One of the continual problems plaguing restorers of any automobile, particularly those from manufacturers that have long since been out of business, is attempting to match original paint colors, or find an original paint color that the restorer likes! To aid in this effort, Patrick McMullen has scanned a number of old paint chip charts for inclusion in the VTR WWW pages. We have also received a new addition (Martin-Senour), courtesy of Scott Martin. When looking at these charts, please remember that these colors have undoubtedly changed over time, may have been subtly changed in the scanning process, and vary greatly according to the settings on your computer monitor, but they can at least give you a rough idea of what some of the colors may have looked like! ACME, 1960 ( ) -- This is a complete chart from ACME dated 1960 for Triumphs. It has the color chips, their names, and ACME code numbers. 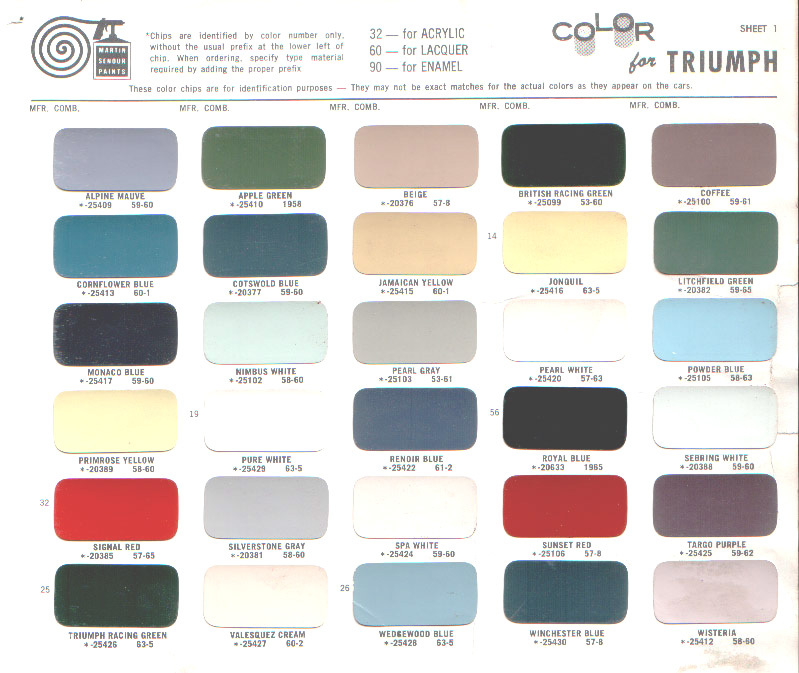 DuPont, 1965 ( ) -- This chart is from DuPont, and includes the color chips, names, DuPont codes, Triumph color code numbers, and Triumph models on which that color was used. 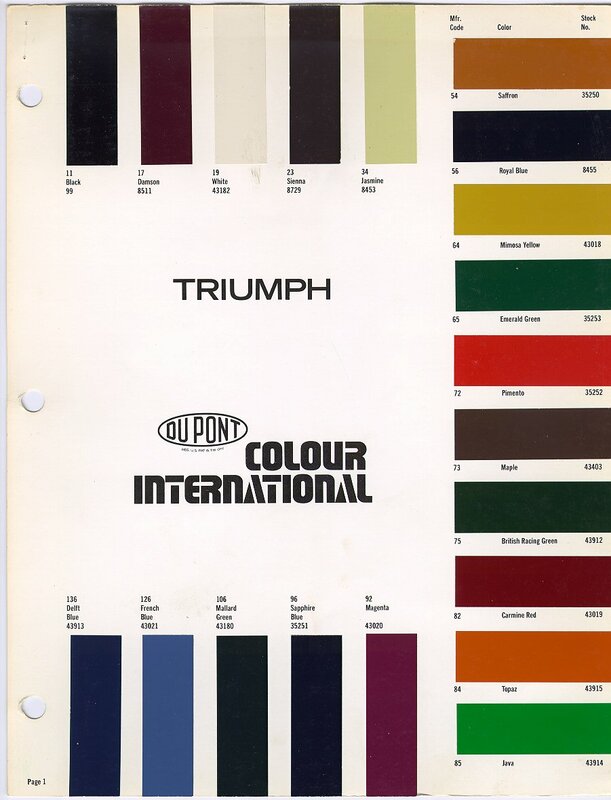 DuPont, 1979, pg 1 ( ) -- This chart is from DuPont, and includes the color chips, names, DuPont codes, and Triumph color code numbers. These colors appear to be for the TR6. 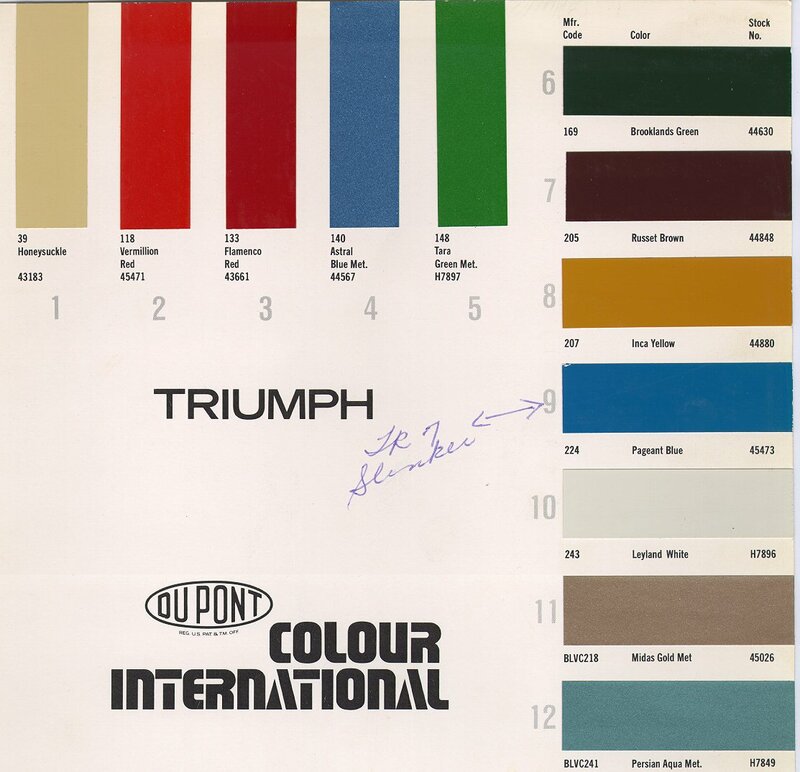 DuPont, 1979, pg 2 ( ) -- This chart is from DuPont, and includes the color chips, names, DuPont codes, and Triumph color code numbers. These colors appear to be for the TR7. Martin-Senour ( ) -- This is a complete chart from Martin-Senour for Triumphs, circa 1965. It has the color chips, their names, and M-S code numbers for colors used approximately 1957-65.